Newer: » May 23, 2013 is World Turtle Day! Press Release - Belize Fisheries Department - May 23, 2013 - The Belize Fisheries Department hereby informs all fishers and the General Public that in accordance with Statutory Instrument No. 54 of 2012 Senator, the Honorable Lisel Alamilla - Minister of Forestry, Fisheries and Sustainable Development has declared the Queen Conch (Strombus gigas) fishery closed to fishing, harvesting or capture of the species on Thursday 23rd May, 2013. 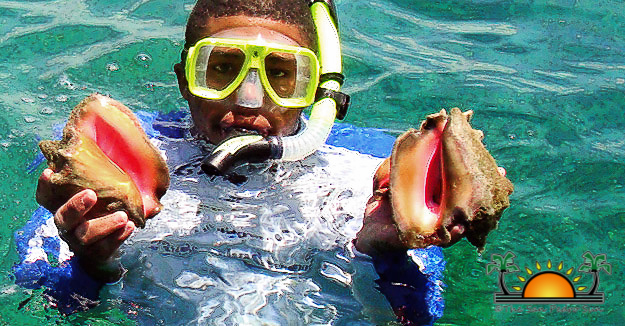 The fishing community is especially advised that all conch fishing activities shall legally cease as of this date until the opening of the next fishing season on 1st October, 2013. The Belize Fisheries Department further advises Restaurateurs and the General Public that a grace period of 8 days, which ends on Friday 31st May, 2013, is being given to allow persons to consume and dispose of all Queen Conch in their possession. Any person found in possession of the Queen Conch after Friday 31st May 2013 will be charged and prosecuted in a Court of Law in accordance to the Fisheries Regulations. The cooperation of the Fishing Community and the General Public is greatly appreciated in the sustainable use and conservation of this important fishery resource. The Fisheries Department advises the General Public to report any illegal fishing activity to its Belize City Offices located on Princess Margaret Drive or at telephone numbers: 224-4552 or 223-2623.